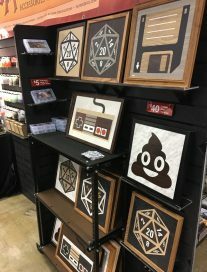 Here we go with some more Gencon 2017 vendors! 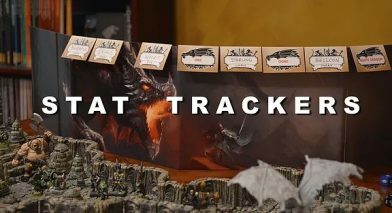 Top Dog has an interesting line of initiative/combat tracking paper hangers (not even sure how to describe them) with part visible to the players and the remainder having stats. Clearly meant for 5e and other crunchy games and a GM screen. Rainn Studios has a great line of combat terrain cardboard tiles in themed sets. The boxes have 66 double-sided, 9-inch diameter tiles in them. Here is a shot of the contents. 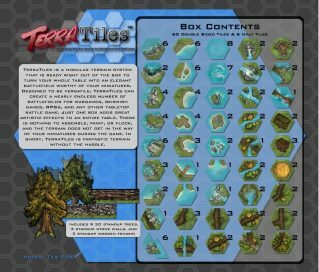 “Terra Tiles” is a great accessory to any board game, but they lack a hex or grid layout. This lends their greatest utility towards measuring tape miniature games (Warhammer) or “Wings of Glory” template movement. 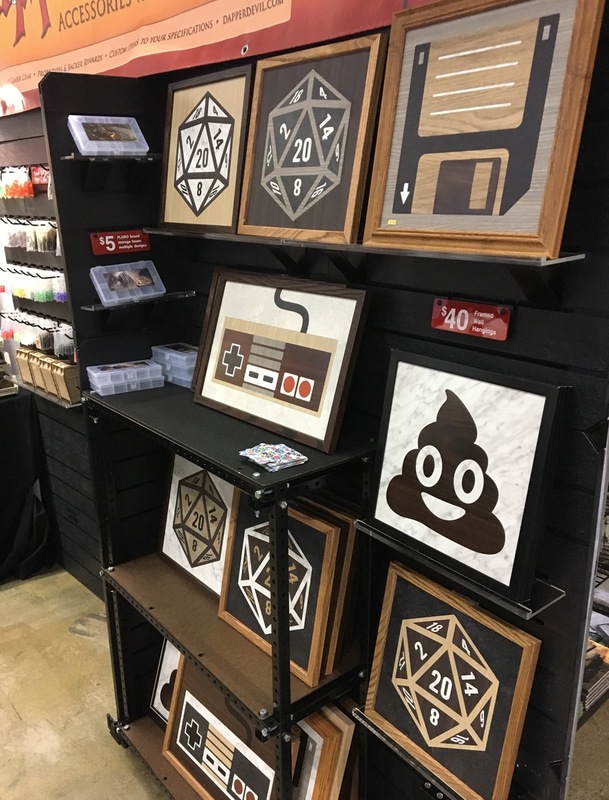 I am not one for the art offerings for gamers, but the wall art from “Dapper Devil” caught my eye. Their chosen medium is wood. Laser cut, I believe. The Dapper Devil’s offerings were well done, wonderfully stark in their simplicity and no chainmail bikinis. 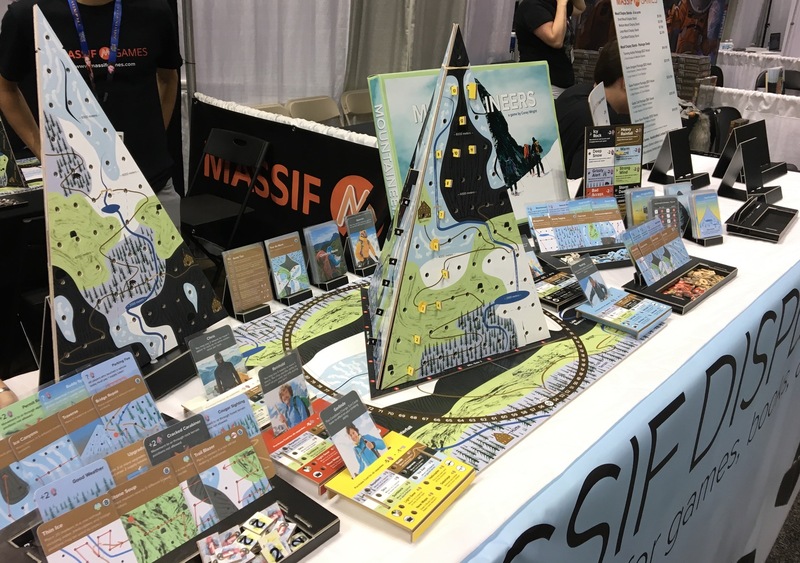 A clear winner for the most unusual board game at the convention, this October 2017 Kickstarter called “Mountaineers” requires an actual mountain! It packs flat, but sets up quickly. Players compete against each other to scale the mountain. I give it high points for an original design idea. I did not get to really play it as it is a pending Kickstarter. Still, it looked fascinating and I will likely give it a try next year. This is one of the stranger, but effective bits of marketing I found at Gencon 2017. Everything Epic had a booth with their new “Rambo” and “Big Trouble in Little China” board games (Jack Burton is my spirit animal), both looked fun. They are in pre-order status so more information to follow on those games. I took some notes and walked away. I made it 20 feet when one of the booth guys ran up and said, “He wanted you to have this” and handed me an envelope. 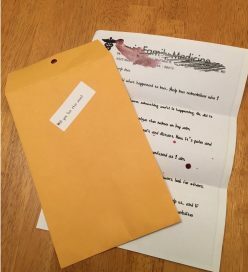 The label said rather ominously,” Will you be the one?” Inside was a mysterious letter written on medical stationary with a plea for help and directions to a website. Best booth pitch ever! 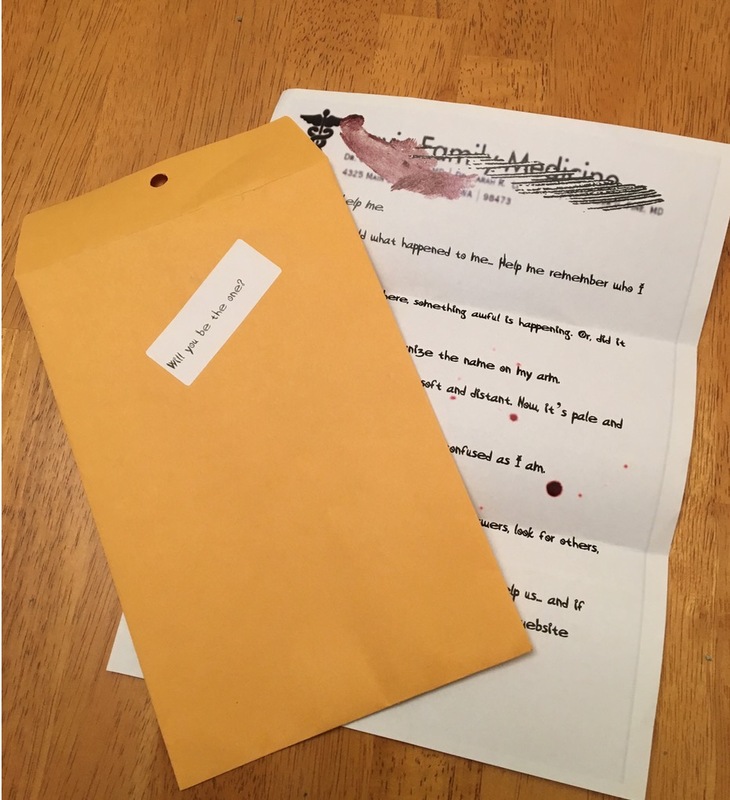 I went to the secret site and did something that I am not allowed to share, but the link above goes to the “public” Coma Ward website with additional information. 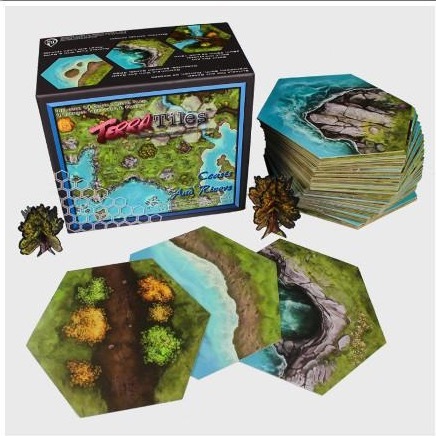 It is a board game where players struggle to escape their own coma nightmare. Mechanically it reminded me a bit of “Ravenloft” with the tile laying or “Betrayal at House on the Hill” with its mid-game strategy change (PvP or player versus event/monster after an initial cooperative phase.) I am looking forward to this one and I think it was an overlooked gem at Gencon 2017. That is it for my Gencon 2017 reports…mostly. I have “Weave” and “Shapeways” on deck as they are full reviews. Look for these in the near future! Worst Movie Monster Reveal Ever! Livingdice Under Seige by Gremlins! May 6, 2010 trask Comments Off on Livingdice Under Seige by Gremlins! Gen Con 2011 Play Report Part 2–With Bonus Swag!